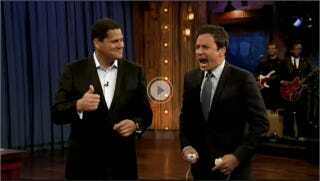 Jimmy Fallon's body was ready, but Reggie Fils-Aime overwhelmed him anyway with what Nintendo had to offer at E3. Nintendo's E3 showcase spanned four consoles while Late Night with Jimmy Fallon featured only three. Well, almost. Reggie Fils-Aime brought the Wii U with him, there were no demos from the new console. Instead Fallon finished a boss battle in Legend of Zelda: Skyward Sword with the precision that only Wiimotion plus can offer and tells us about how great it feels to hold the Wii U. You can almost see Fallon's chin quiver when Reggie tells him it won't be released for at least another year.